Announcing the Busy Mom Bundle! 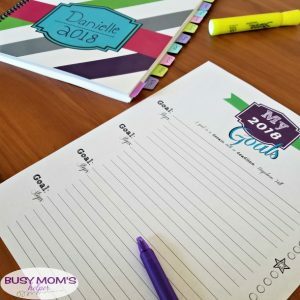 I’ve been working like crazy behind the scenes creating something for all my fellow busy moms out there to make your lives a bit easier, and maybe even more organized. I’m thrilled to finally announce the Busy Mom Bundle! 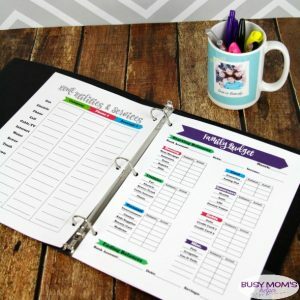 We’ve taken several of our most popular products and are offering them as a complete set for all the parents out there – whether you need help organizing your families important files, want meal plans already done for you for a YEAR, love Disney activities, need a reliable planner, or help planning the best summer camp ever – this Busy Mom Bundle has practically EVERYTHING to help out! From getting all your important files, documents & information together with the Family Home Binder, to having a whole year’s worth of weekly meal plans (with the recipes, of course) already done for you. Keep track of your schedule and tasks with our beautiful planner. You can even earn money hosting an awesome summer (or Spring Break) camp for kids with our FOUR different themed camp kits – or just enjoy them as bonus activities for your own kiddos! Plus, both the Disneyland-California AND generic versions of our Unofficial Disney Activity & Autograph Books – perfect for that upcoming Disney trip, or just a great booklet for Disney lovers. 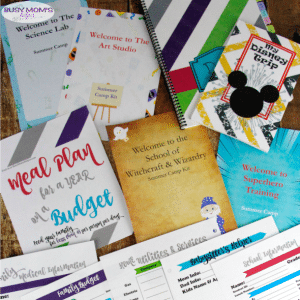 These fabulously fun and helpful books and kits sell individually for $2-$10 EACH (except the planner, it’s always free), but with the Busy Mom Bundle you can nab the whole set for just $8 – that’s less than the cost of ONE of the summer camp kits or the meal plan pack alone! Summer Camp Kits – a great way to earn some extra cash! Don’t want to do a camp? They still make great preschool themes, party plans & ideas or just awesome kid activities! access to LOTS of free printables to assist in your camp, such as invitations, sign in/out sheets, name tags, coloring pages, photo booth cut-outs, banners, drink labels, food cards, etc. Daily food costs average to less than $5 per person per day! Like I said, the Busy Mom Bundle will be only $8 – such a great savings from buying the printable sets individually! But here’s the thing – we’re celebrating this awesome kit by doing a TWO DAY SALE when it’s live – by selling it for just $7! Yup, when it becomes available in our shop next Tuesday, March 6th at 6am until Thursday, March 8th at 8am you can nab the ENTIRE kit for just $7 – that’s less than a single summer camp kit set or the meal plan book all alone. So mark your calendars, because this amazing, parent-sanity-saving set will be available starting next week and you can save more by purchasing the first two days. WOOT WOOT! A YEAR of Meal Plans with Recipes – on a Budget! Which of the printables would YOU most like to have? Isn’t it such a pain to sort through a ton of documents and files to find the information you need, especially when you’re in a rush? 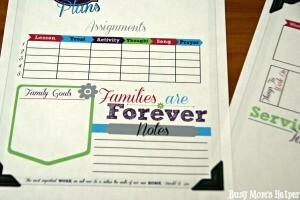 Now you can keep all your family’s important info in one, easy place with these Family Home Binder Printables! We’ve got everything from medical forms and emergency contacts, to shopping lists and babysitter sheets, plus budgets and more to make your life as a busy mom much easier and organized. After lots of asking around as to what people preferred, we made our home binder printables simple and clean-looking, while still being stylish with some pops of color. 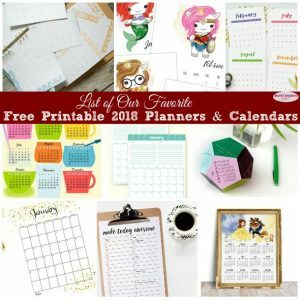 It goes perfectly with our 2018 Free Printable Planner, as well as our awesome 52 Weeks of Meal Plans (with recipes) Book! We tried to include the majority of lists and documents that a busy family would need, helping you keep track of everything in one, convenient place. Once you have the PDFs, you can print off as many as you’d like (such as with the monthly budget sheet or weekly menu and shopping lists) – for personal use only, of course 🙂 We even included several cover options, so you can print off whichever you like best. What’s included in the Family Home Binder Printable pack? That’s a LOT of pages, but super important to have handy when your family needs them. You can nab the entire set now for just $1.99 – what a deal! It has the days listed out along the top, and then to the left it’s divided into AM, PM or Eve (evening) so you can spread it out a bit by times, as desired. One that many people forget to have on-hand is a list of their utility companies, contact information and account numbers – because we don’t really think about it until something happens and we need it RIGHT THEN. Now you can have them all neatly listed out on this sheet. We pre-filled some of the lines with the general types of utilities many people have, but it still has plenty of lines for adding in others as needed. I never really thought to have a sheet of all my kids’ school information until we took a ‘parents only’ vacation and my uncles were watching them for almost 2 weeks. Now you can print off a sheet for each school child, and have everything on there – from their homeroom teacher’s info, to their schedule (including bus) and more. Along with having that easily accessible when you have a sitter, how about a BABYSITTER HELPER sheet? You can add the details for that particular time, plus things like what they should eat and what times. So useful! For a long while I was using plain, boring paper to write out our family’s weekly menu – now it’s much more fun (and not such an eye-sore on my fridge) with this cute weekly menu that I can fill in. This is the same design I use in our Meal Plan on a Budget Book, along with the fun shopping list page. I’m crossing my fingers and knocking on wood right now as I type this (you know, just in case I jinx myself) – but we’ve only had to take a child to the emergency room ONE TIME. With 5 kids, that’s such a lucky blessing! When that did happen, though, I wish we had this medical form so I could have all of his information in one spot to take with us instead of trying to dig it all out and call hubby back home to find the stuff I just didn’t remember. Super stressful! You can even use it when going to new doctors and such, since you can put all of their allergies, medications, past surgeries and the like on there. This page alone would’ve been well worth the mere $1.99 cost when we had our ER ordeal – and you can nab the whole set for that cost! Woot woot! …including a sheet of more emergency contacts. We also included a mostly-blank page where you can draw out a rough idea of your home escape plan, for instances such as a fire. This is great to practice with the kids regularly, so they know what to do should the worst happen. Okay, now that we’ve covered those very urgent, hopefully-won’t-be-needed forms, let’s move on to something a little more fun – a place to put all those birthdays we try to keep in our minds constantly! Whether you just track your immediate family’s special days, or include every aunt, uncle and second-cousin-twice-removed, there’s spots for each month! I know not everyone likes keeping a budget (I’m actually in love with budgeting, so for me it’s fun), but in case you do there’s a sheet to track all of your monthly finances! Phew, that’s quite a ton of papers – but when you’ve got an entire family and household to care for it can be SUPER helpful to have all that information in one place. You can either put it in folders, staple it together, place it in a binder, or even just spiral-bind the packet yourself. Whatever you choose, this family home binder printable set is great for any busy mom, dad or family! Do you have a “mom van”? We’re talking about a vehicle that you live in for the better part of the week because you’re always shuttling kids here and there. Yes, I have a mom van myself – between dance, karate, the store and running to/from school, it gets good use out of it. That means it can get SUPER messy with all our stuff, and crumbs (even if they don’t EAT in the van, they manage to get crumbs everywhere – what the heck?) So what can you do to keep yourself sane? Here’s a few simple tips on How to Organize Your Mom Van! Organize Bit by Bit – You will want to create sections within your mom van that you can organize according to who sits where and what their needs are. Toys and games for the toddler? Towels or extra shoes for a young sports star? Organize sections of the car and use collapsible bins for storing goodies and important items. Create trash solutions – Nothing ruins a car/van quicker than trash and every mom knows that where kids go, trash goes, too. Fix this by putting some mini trash bags in your van on all seat rows/levels so it’s accessible to everyone. And ziplocking baggies can be your best friend when organizing your mom van! Create snack solutions – How often do your kids need to have a snack in the car? Whether it’s an afterschool shuttle to soccer practice or a quick meal before going to a doctor’s appointment, there’s a good chance your kids are going to be eating in the car. And what about those days they forget their school snack and you’ve already left the house? Be prepared with some baskets or bins of car snacks that you keep in the van at all times – make sure they won’t melt, and the less ‘messy’ the better (at least for US, right?). Toss some water bottles in there, too, just in case. You can also include some goodies for yourself – after all, even the chauffeur needs a special treat! Maybe a book or magazine to read while you’re waiting in that carpool line to pick up a kid? What are YOUR tips for organizing your mom van? Raise your hand if you’re a multi-tasker! I sure am – but that’s not necessarily a good thing. As busy moms, we often pride ourselves on our ability to do many things at once – and with all we have to do, it’s not avoidable all the time. But really, we’ve got to learn How to Stop Multitasking and Get More Done! You may think that multitasking is helping you get more things accomplished in your day, but many studies have shown that it does more harm than good. When you’re doing a specific task, you need to be sure you’re focused only on that specific task and not anything else at the moment. This will help you be more efficient with what you’re doing and you’ll get through things more quickly. It’s also super easy to get started on several things, but they never really get finished because we were handling too much all at once – or we were doing one thing, saw another and remembered it needed to be done and switched our focus, then several items later never make it back to the one we started with. Crazy, frustrating and exhausting, right?! By just focusing on one thing at a time, it not only gets done BETTER, but you can check more things off your to-do list, rather than have many things half started but not completed. Make a list of things you need to do, then prioritize your list. Put time estimates beside each task of how long they will take you. That way, if you find you have about 15 minutes, you can pick something that takes about that long to get done – instead of wondering what you can fit in and simply waste that time not deciding. Take each task one at a time and commit to doing it until finished. This also frees up your brain power from trying to keep too many tasks ‘open’ in it all at once. Block out your time throughout the day in chunks, based on your to-do list. I do better with smaller chunks of time, since it doesn’t seem so daunting – you can divide larger tasks up into smaller ones to help this, too. Allow yourself breaks in between completing tasks. You’ll be more focused on getting it done, and have a chance to refresh knowing you get a rest time when complete. Practice it until it becomes your new habit. Changes don’t happen instantly, especially with long-ingrained habits like this, so be patient and just keep at it the best you can. What are your tips to get more done in the day? 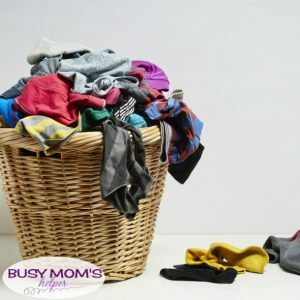 Us moms have to juggle many tasks and wear many hats, from carpooling and checking homework, cleaning and laundry, managing the budget and shopping, and sometimes even a whole slew of job work! It might seem like you never have time to stop, or even slow down with your enormous to-do list – but it’s important that you manage your time and your busy tasks as well as you can so that you CAN still get quality time with your family, as well as some time for yourself. 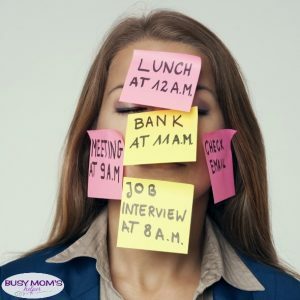 Here’s some Time Management for Busy Moms to give us ALL a little help! It’s very important to your well-being, as well as the well-being of those you care for each day, and many moms just don’t make it a priority. I struggle with that all too often myself, so know what you’re up against! Maybe one or two of these time management tips will give you a little help and guidance. Delegate – Whenever possible, try to delegate some tasks to someone else. Sometimes busy moms try too hard to do it all when there are tasks that others are perfectly capable of helping with. Despite what some husbands might think, they’re perfectly capable of helping with the house cleaning and such. No, they may not load the dishwasher perfectly how you want it – but if the dishes will still get cleaned, great! Are your kids able to help fold the clothes (who am I kidding, we don’t ‘fold’ clothes in our house – it’s wash, dry and put away in drawers or hung in closets!) or maybe wipe down the counters? Let them help! Create a schedule – You need a schedule and you need to stick to it. It might seem difficult when everything is happening at a crazy, breakneck pace but it’s important you follow the schedule to help manage your time properly. Once you force yourself into a habit of following a schedule, it’ll become easier to do and help you get done what you need to while seeing where you can fit in other things. Use a timer – Focus on one task at a time and use a timer to block out short blocks of time to get things done. The timer will keep you on task while also helping you see how much time you’re actually spending on things. It’s easier to tackle scrubbing toilets when I have a timer for only so many minutes – I can do REALLY good cleaning for those minutes, then I get a break! Don’t overcommit – This is a difficult one for most moms but it’s important not to overbook and overcommit yourself. Sometimes you just need to say no because you already have too many things going on. There’s nothing wrong with this at all, regardless of why we tell ourselves we have to say yes or let ourselves feel guilty when we don’t. Us busy moms are AWESOME – but we’re not time lords or anything, so we just CANNOT do everything. Please let yourself say no sometimes. Y’all remember when I shared how important it is for us moms to have a hobby of our own? I know that it’s easier said than done with how much we need to squeeze into each day – but with these time management tips for busy moms, hopefully we can ALL can keep ourselves on schedule a bit more and feel like we have some downtime now and then, because every mom deserves that! What’s YOUR best time management advice for busy moms? 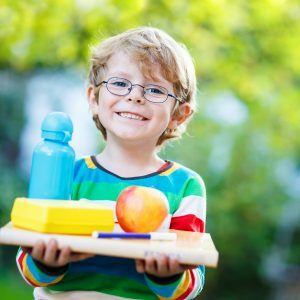 When you homeschool, you’re going to collect more teaching aids, books, papers, lesson plans, arts and crafts, and other related items than you’ve ever had before. You’re going to need someplace to put all this stuff, which can be frustrating when you have limited space in your house. Here’s a few tips and ideas on How to Create a Homeschool Area in Your Existing Space to give you a little help. Create multipurpose rooms – Maybe your garage can double as a gym, and your dining room can double as a space for homework and art projects. Try to look beyond the typical room ‘assignments’ and come up with what works best for you. We currently have our ‘formal’ dining room as an office, and use our breakfast area as our only dining spot. Make it livable – You might try to create a homeschool area inside a small portion of your home such as a small home office, a sitting room, or even a closet (at least for storage). If it’s not livable and practical with the rest of your home, it’s not going to work long term and will only cause more stress and frustration. Work with the things you have – You don’t need brand new furniture, expensive student desks, or fancy gadgets to make your homeschool space work for your students. You can work with the things you already have, and you can use old furniture and other thrift store items to create your own workable homeschool area. 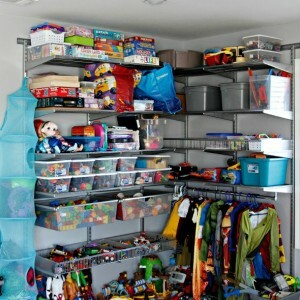 Have lots of storage – You can never have too much storage in a homeschool (well, you probably can – but I doubt many of us have reached that point yet!). Seriously, boxes and bins are your friends. You can work with the space you have when you maximize it with great storage solutions. And labels – don’t make it a nightmare to find what you need WHEN you need it! Build around your goals – Don’t obsess over those homeschool spaces you see on Pinterest, or even what another family is doing. Build your space around the goals YOU have for your students and yourself. Then you’ll have everything you need right in the space that you have available. Win-win! With these tips and ideas, you can create a homeschool area in your existing space that will work for all your needs, and hopefully will make your entire home life a bit less overwhelming for everyone. If you homeschool, where do you do it in your home? Do you feel like the housework never ends? I sure do! This is a common complaint for busy moms and – whether you have one child or six – it can feel like the housework is constantly piling up on you. In the case of laundry and dishes, it LITERALLY can be piling up (story of my life, it seems!) However, there are a few ideas on tackling Housework for Busy Moms, to help streamline the cleaning process and help you to feel like more of your time is freed up, instead of spending it all cleaning all the time. The housework tips below may seem so simple, but while many us might already KNOW to do these things, actually doing them is another story. After all, us moms are notorious for not asking for help – even when we really need it! Let’s try to get past that, and see if any of these ideas about housework for busy moms can help us out a bit. Delegate what you can – If your kids are old enough, they can be helping out – don’t think you have to do it all on your own. If there are cleaning tasks you can delegate to others in the household – like your hubby, then don’t hesitate to ask them to pitch in. Block out time for similar tasks – You can also streamline your housework by doing it in blocks and chunking similar tasks in those blocks together. Maybe you clean for 45 minutes in the morning and you knock out all the bathrooms. Then in the evening, you do dusting and vacuuming, for example. Set a timer, so you SEE your time and know that there’s a limit – you won’t be cleaning all day long. This helps me a lot, just knowing that it’s a very specific time that I’m stuck doing a task I don’t like. 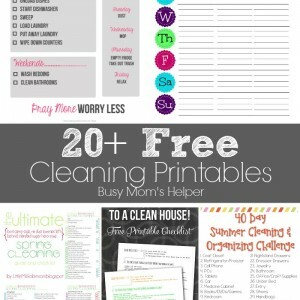 These are just a few ideas to help us busy moms tackle the housework. Your mileage may vary since every home is different and your needs will be unique. However, some careful planning can help make the entire process easier for you and will help you save time. And don’t stress if there’s a few exceptions you need to address – like for me, it’s toilets – that’s a chore than hubby knows I refuse to do, so he’s wonderful and does it. Yay!